Are you eager to launch your mechanical design career, but lack practical experience? To be a successful candidate for mechanical designer jobs, resume expert Kim Isaacs says it helps to have a comprehensive resume. 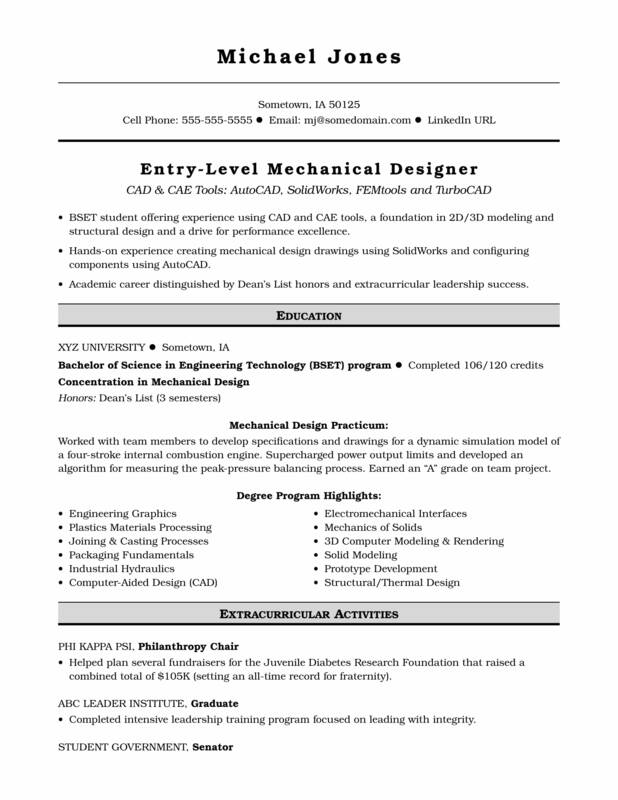 To see how to present your academic credentials so you can get noticed, view the sample resume Isaacs created below and download the entry-level mechanical designer resume template in Word. And if you need more help, let the experts at Monster's Resume Writing Service create a high-impact resume for you that will impress employers. BSET student offering experience using CAD and CAE tools, a foundation in 2D/3D modeling and structural design, and a drive for performance excellence. Hands-on experience creating mechanical design drawings using SolidWorks and configuring components using AutoCAD. Academic career distinguished by Dean’s List honors and extracurricular leadership success. Worked with team members to develop specifications and drawings for a dynamic simulation model of a four-stroke internal combustion engine. Supercharged power output limits and developed an algorithm for measuring the peak-pressure balancing process. Earned an “A” grade on team project. Helped plan several fundraisers for the Juvenile Diabetes Research Foundation that raised a combined total of $105K (setting an all-time record for fraternity). Completed intensive leadership training program focused on leading with integrity. Elected to represent fellow students, serving as a primary campus Student Government Association liaison. Served on policy-making committees and represented student interests at university functions. Led publicity and promotions for special events, films, lectures and concerts.